If 10 years ago someone had told Mike Jensen that he would one day drive a fire truck nearly 1,000 miles to California to help with a wildfire, he would have said they were crazy. But that’s exactly where Jensen and three other Keizer firefighters, Bill Herring, Matt Dryden and Aaron Pitts, found themselves on Dec. 8, assisting with what would become the largest wildfire in the state’s history. The Thomas Fire began on December 4 at 6:28 p.m. to the north of Santa Paula, Calif., near Steckel Park and Thomas Aquinas College, 70 miles northwest of Los Angeles. That evening, the small brush fire exploded in size, thanks to 60 mile per hour Santa Ana winds, and raced through the rugged mountain terrain. KFD, as part of a Marion County task force that also included firefighters from Silverton, Salem and Woodburn, left for California on Dec. 5. By the time they arrived to the Ventura County Fairgrounds on the morning of Dec. 7, the fire had grown to more than 115,000 acres. 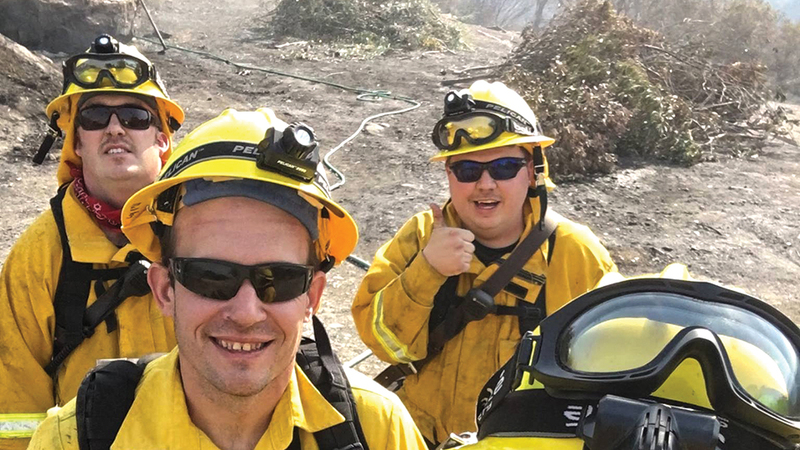 Their first day of work, which mostly included protecting homes and schools in the Ojai Valley by patrolling the area, putting out hot spots and clearing any dry brush that could catch fire, was Dec. 8. “There was a lot of being there in case the fire came close to people’s homes to try to prevent it,” Herring said. The crew worked 24 hours on and then 24 hours off. But their off time was mostly spent cleaning equipment, eating and sleeping. Herring said any photos taken of the fire, which by Dec. 19, when the Oregon State Fire Mobilization Strike Teams began departing, had grown to more than 270,000 acres, didn’t do it justice. “Until you’re up close and actually see it, the magnitude of it, the fire is impressive in a photo but until you see the size of the area and how far it had to travel and the total destruction in front of you, the photos don’t sum it up,” Herring said. Jensen won’t forget the sound. Jensen and Herring were impressed by the multi-million dollar homes they were protecting. “It’s like all of the homes that you see on HGTV but you never in your lifetime get to visit them,” Jensen said. “One of the last days, we sat at a house for instructional protection and they had an infinity pull overlooking a cliff and you could see right into the ocean,” Herring said. The people were also thankful. As of Jan. 3, the Thomas Fire had burned 281,893 acres but was 92 percent contained. It had destroyed 1,063 structures and damaged 280.